The German Shepherd Dog is not an "outside" dog. ALL GERMAN SHEPHERD DOGS REQUIRE MENTAL AND PHYSICAL STIMULATION, as well as human companionship, socialization and training. This is not a breed to be left out in the yard, away from it's family, isolated or deprived of touch or attention. 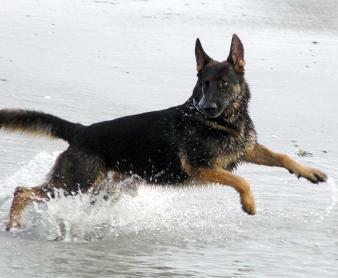 GSD's are not couch potatoes and they will insist on interacting with their person or family. They will not thrive as a kennel dog. They need to be exposed to the outside world, other people, animals, the movement and noises associated with being away from home, as well as, at the very least, basic obedience training. Regular exercise and activity is a must. This all equates to TIME, SACRIFICE AND COMMITMENT. All German Shepherd Dogs shed a lot all year round and generally "blow" their coat twice a year. If you are finicky about dust bunnies or hair on your clothes or furniture, perhaps a non shedding breed would be more suitable. German Shepherds are naturally protective of their family and territory, and bond for life. They are extremely loyal, so the decision to adopt a GSD should not made on impulse. 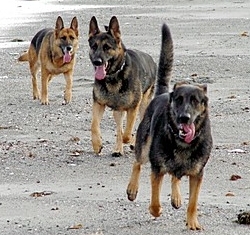 German Shepherds are sometimes aloof with or suspicious of strangers and are seldom submissive with other dogs. German Shepherds do not respond well to being left alone for excessive periods of time. They are high energy dogs that enjoy having a job to do and want to stay busy. "His character corresponded to his exterior qualities; marvellous in his insinuating fidelity to his master; towards all others the complete indifference of a master-mind, with a boundless and irrepressible zest for living. Although untrained in his puppyhood, nevertheless obedient to the slightest nod when at his master's side; but when left to himself, the maddest rascal, the wildest ruffian and an incorrigible provoker of strife. Never idle, always on the go; well-disposed to harmless people, but no cringer, mad on children and always ---in love. He suffered from a suppressed, or better, a superfluity of unemployed energy; for he was in heaven when someone was occupied with him, and he was then the most tractable of dogs. 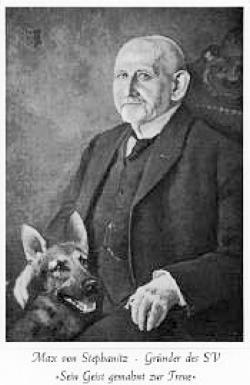 The man who rears a dog must complete what the breeder began: the breeder can indeed lay the foundations of a good and serviceable dog, but the trainer must see to it that he brings to their highest possible development the physical and mental foundations already laid, and thus his is the more grateful task. "It is often a matter of the inherent tending instinct with the shepherd dog, who is not working with the flocks, which makes him take care of other living beings in his own way, to gather them together, to fend for them, but also not to allow anything to be done in contravention of law and order, according to his own private interpretation of what that is." 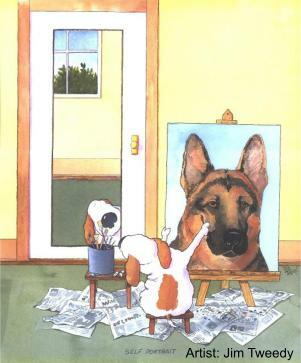 "A good dog observes his master so closely that he almost knows him better than he does himself, and he must often indeed wonder that the reverse occurs so rarely." "Whenever the dog is kept in an enclosed kennel, ...he will not only degenerate physically, becoming stiff, sluggish and lazy, but will also become mentally torpid, and lose all his sharpness and vim." GSD Genetics - A list to discuss all aspects of German Shepherd Dog genetics, whether colored or white. gsd-euro � GermanShepherd-Euro - The GermanShepherd-Euro email list was founded to provide a meeting place where people interested in the breeding of European line German Shepherds (West German, DDR, Belgian, Swiss and Dutch), from around the globe could co-operatively communicate their experiences, share their knowledge, and exchange important information regarding bloodlines and pedigrees.